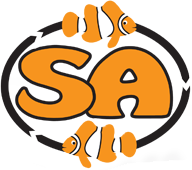 Since 2003 the Tennessee SA Hatchery breeds dozens of species from resident broodstock and every month provides tens of thousands of colorful healthy fish with high survival rates and superior satisfaction to the end customer and superior margins to retailers. In this hatchery, survival from birth is often near to 99% through the entire life cycle which of course is a prerequisite for these wonderful animals to have high survival rewarding to the hobbyist! Founded from interests that included those of the hobbyist, scuba diver, process engineering, degrees and studies in EEB, Marine Biology, and molecular biology as well as funded excursions on scientific work in the great lakes, the keys, Oman, the South and Indo Pacific and one multi-month mission from the Equatorial Atlantic to the edge of the arctic ice pack, our approach to SA has always sought to apply the most modern edge of process engineering, formalized problem solving, benchmarking and modern management to achieve the highest yields and highest levels of sustainability. High yields define SA in a very important way: If a hatchery has a very low yield on eggs, as most do, the survivors have been compromised by that which killed their siblings and will not offer the retailer and the hobbyists the best experience. If yields are low, sustainability is compromised by the resources that went into that fraction of production that was lost, including the life, energy, and material resources. For SA sustainability means many things: taking less from nature, using less CO2, achieving and contributing to the highest yields and survivability, creating and sustaining economic partnerships with those who can safeguard our nature with caring husbandry, and creating greater awareness that further these goals. But more than anything else, it means the abems here based on making clean water and using high quality Instant Ocean synthetic salt to provide consistent high quality water for broodstock, larval and grow out. A 150 KW standby power system powered by City Utility Natural Gas insures that nothing can interfere with the steady state control we have over all conditions. Very early on we tested all the commercial foods we could find on the market, and had them analyzed and tested in our systems on lot controlled grow out and over time, this testing and analysis led us to conclude there were ingredients, and processes, missing in all the commercial feeds we surveyed, which included virtually all available. As a result we developed the SA Hatchery Feed, which is a critical component in our success with regard to color, growth and healthy and the robustness of hatchery operations. In late 2008 we began to understand the nature of sustainability in new ways, that we had to support native collectors, but channel them towards those species where could be collected and transported sustainably, focusing on juvenile animals, and those species that could do well in this business. From this beginning rose the Sustainable Islands Division of SA, where we collect small and post larval animals and rise them up in the separate SI facility. In 2010 we began setting up coral “Farms” in the Indo-Pacific, selecting isolated sustainable broodstock and growing out frags for several months before transport and final grow out in TN. These products began availability in 2011.